There are two absolute truths in life. Two: We must constantly adjust to change. I don’t know how many of you are like me. I absolutely love to think things through, consider all the options, make a plan, and then…. STICK TO THAT PLAN. My logical brain is fixated on this pattern. It sorts everything out, puts it on a shelf, then moves on to the next challenge, fully expecting nothing to interfere with my stratagem. 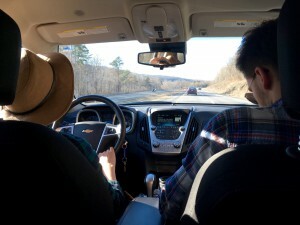 Speaking of transitions… look at me, sitting in the back of the car while my children Sarah and Aaron drive. Yet one of many changes I’m working on accepting. The world around us, our bodies, life experiences and our emotions are constantly in a state of flux. These things just never stay the same. So what happens when that flux comes crashing in against our well-made plans? Transitions. The dictionary on my MacBook defines transition as, “the process or a period of changing from one state or condition to another.” Oh, that sounds so uncomfortable for me. As a musician, I find the musical definition for transition much easier to accept. “A momentary modulation from one key to another.” That term, “momentary” is so much gentler than “change.” How I wish that all transitions were momentary. The harsh reality though, is that they are rather permanent. Usually life changing. And if not so, at the very least they dash our plans to pieces and force us to rethink, rebuild, and compensate for an entirely new set of circumstances. There are many such times in life when this occurs. I was thinking the other day about the whole process of birth. In the womb we can imagine everything being warm, soft, soothing, comfortable. Then as time passes, we grow bigger and mom reaches a point where her body says, “That’s enough! Time for you to be out on your own!” Labor is the process of transitioning from that warm, liquid-y comfort of development to the harsher world of light, air, cold, heat… and independence. Birth is absolutely necessary, but unquestionably painful for both baby and mom. Indeed, if this transition did not take place, both mother and child would die. However uncomfortable the process is, one thing is certain. Change is necessary. Interestingly, the process of being born sets an excellent model for many other phases of life. We grow, go to grade school, middle school and high school from the comfort and care of our home. We’re protected, cared for, fed, funded, and nurtured. Then one day we move out. Off to college, off to our own apartment, start working for ourselves, paying our own bills, and learning how to live without mom and dad telling us how. For most young people, this transition is uncomfortable. It involves lots of trial and error, course corrections, challenging conversations, and for most, financial struggles. Transitioning from being a dependent of others to adulthood is such a critical phase of life, but often is like the birthing process where you move from a place of comfort and protection, to a place of facing life’s challenges on your own. Again, change is necessary. There are two more transitions we’ll address here. Our physical bodies are designed to regenerate constantly. However, there is a caveat to this process. Over time, the cells that die off begin to outnumber the cells that are created. We call this natural process aging. We ALL age. Sometimes this is dramatically accelerated by physical changes brought about from disease, accidents, or genetics. Whether slowly over many years, or suddenly because of unforeseen events, we all reach a point where we cannot do the things we once did. The way we approach life must adapt to our abilities to do things. The more willingly we accept these inevitable changes to our human body and mind, the more gracefully and peaceably we live our lives. Acceptance and accommodation are wonderful things once a path is found to adjust. So whether you’re like me and are suddenly hit with something like life-threatening cancer, or like my wife who has her full vigor and strength and is aging naturally, understanding the transformation of our physical and mental condition — and then discovering new ways to live life to its fullest — becomes a transition we all must eventually face. Change, once more, is necessary. The final transition, death, is the most unknown. In every other situation, we have the luxury of talking with people who have gone through life’s changes. We can ask them questions, seek counsel, receive experienced encouragement, and draw strength by seeing how others adjusted when changes arose. Death, however, is one thing where we know it’s going to happen, but there are no friends or relatives whom we can talk with that experienced it and can tell us what to expect. We do have comfort in God, however, because Jesus died and rose again. But rather than discussing what He said about “the other side,” let’s look instead at how He faced death. This is a Master blueprint for us on how to face the last transition in life… and consequently, how to face any transition in life. Jesus showed us to simply trust God and let go. He showed us that we can’t hang on to the status quo. We need to surrender what we have, and receive whatever is next. I’ve found in life, that what comes next is almost always better than what we so desperately tried to hold on to. Why do we struggle so with transitions then? That first bible quote at the top of this article says it all. We don’t like change because we don’t trust God. We trust ourselves instead. We like to trust those plans we made and so carefully filed away, even when all the circumstances tell us they no longer work. I am confident that as we learn to live more freely, the more wonderful discoveries we will experience. Give it a try with me, and let me know how it goes! This entry was posted in Lifestyle, On Terminal Illness. Bookmark the permalink. Wow Sandy – another amazing set of insights to share. I’ll take the challenge, even though even thinking about giving up some of my specific holds makes me feel physically uncomfortable! To willingly suffer a perceived loss… you’re on!! There are so many things in life your words have meaning to! And you are certainly right about not being able to sit down and talk to a loved one on the other side. I do feel loving spirits around me though quite a lot , and I believe they help me to know that leaving our earthly bodies behind is not the end, but yet another change, and not a bad one. A very SAD one for everyone left behind. However in my experiences it becomes amazing when you let yourself feel the spirit of a loved one reaching out to you letting yourself know that they are still watching over you, loving you in a non physical sense. I still cry for our mom, dad, grandparents, family and friends who have passed and wish I could sit down at a meal with them, or just hold their hands. Then something amazing usually happens, a double rainbow, a low flying hawk, a beautiful cloud with features I recognize, a soft brush on my forehead, a knowing feeling in my heart that they are indeed ok, and watching over me and reminding we will be together again. That our souls still are bound. I had to learn the hard way with John’s illness, that I had no power to change things. The only way to get thru any kind of hard time is to “let go and let God”. You are so right about holding on loosely and allowing change to happen. God does indeed know what is best. I wanted to let you know how much I appreciate your comments. Yes, I still have mom’s necklace you gave me early on. Holding it and seeing it remind me of those times when she’d sit with me, encouraging me that, “You can do this!” “Be creative about it.” and, “Everything is going to be okay….” Those memories do keep her alive and present in my mind, which is often a tremendous help on the difficult days.